Zombocalypse Zombocalypse is one of the shooting games. You are the member of Bravo Team and your mission is to eliminate all of the zombies in the world. You will be placed on a street where zombies will be coming to attack you from both of the sides. Weapons randomly drop from the sky and you need to collect them to kill zombies. 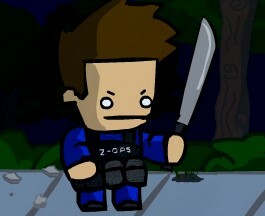 There are various weapons and you also have a machete in your hands when you are out of your ammo. If you are looking for a new game to play then you need to try this successful production.